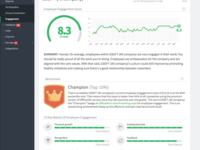 Officevibe is an employee engagement survey software with key features like anonymous employee feedback, eNPS tracking, reports for every team and the whole company, and an extensive improvement section. 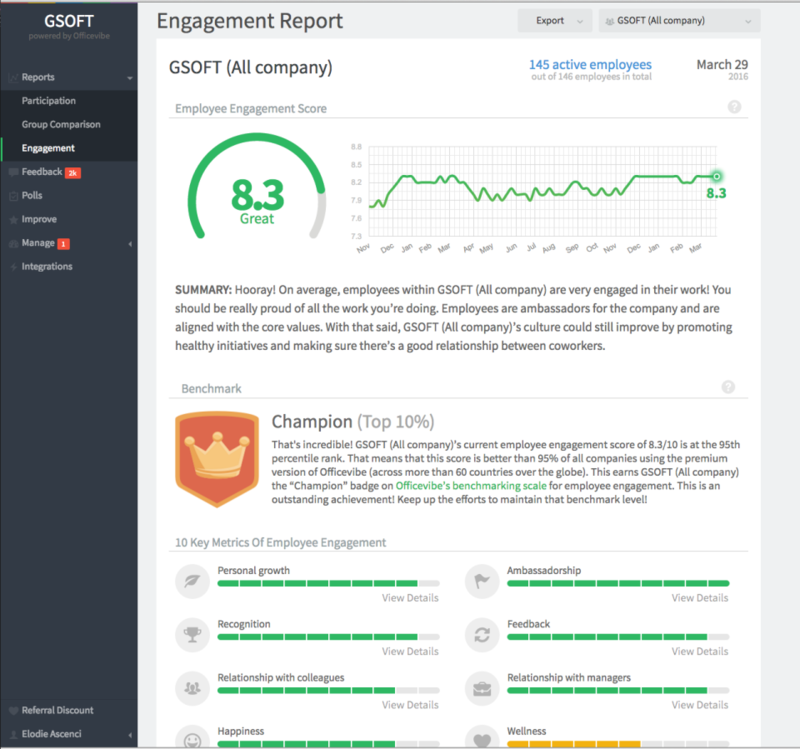 We provide real-time insights on your employees happiness & productivity. Our 350+ pre-build questions are based on industry standards and make sure every aspect of your company is covered. Pros: With staff moral suffering, this tool has been invaluable in helping give metrics that my boss can take forward about how to improve the team. When you set it up you set the people that are part of your team & they receive emails. From that point people receive weekly reminders to contribute how they feel. The system makes use of really simple graphically styled questions which are similar to psychometric testing in how they are interpreted. When we first installed this, all the staff has a demonstration about what was recorded & how their answers contributed to the team statistics. Where your team are failing there are really useful hints and suggestions for how to improve your scores. Customer service is good with a quick response to questions. Overall we have found this to be a really useful tool for analysing and capturing specific metrics about how the team is doing along with specific tools to make your team more productive. It facilitates difficult conversations with anonymous feedback which even in a small team where it is obvious who has made the comment is still useful. Cons: When your staff members receive their first emails and try to set up their accounts, they don't set up passwords which can be very confusing initially. Slack integration is slightly haphazard. It uses a bot to integrate but conversations are one way. Answering sends you back to the website. Anonymous comments are useful but in a small team it is quite obvious very quickly who sent which message. Regardless that can be a good way of breaking difficult conversations. Overall: Helped us get quantifiable metrics about the performance and feelings of the team rather than just hearsay. Pros: The platform is really easy to use and the functionality of drilling down into individual team results is great. It enables team manager and admin access, and keeps track of all previous comments and trends. Cons: The inability to customise questions is frustrating at times. Whilst most of the questions are very relevant, the pulse checks cover so many different areas and there is power in picking and choosing areas to survey on and focus improvement efforts. Also, some questions are not relevant to our business so the ability to turn on/off would be brilliant. Recently there have also been some data issues where homepage results don't equal the same categories when you drill into it. These have apparently been rectified but we lost a bit of confidence given it occurred over several months. Overall: It's been almost 2 years since we started using OfficeVibe and despite a few issues, it has been a mostly positive experience with comprehensive trend analysis and functionality. Pros: OfficeVibe takes the guessing game out of what our employees want, need and how to keep them engaged with their weekly easy to use surveys. Setting up OfficeVibe was simple and we have been able to work on trouble errors that we didn't even know were a problem. This software has given our management team insight into our staff and has given our staff a place to be honest about their feelings about the company, management, and their peers. The engagement report gives you a comparison of all teams and their standings from engagement to happiness and satisfaction. OfficeVibe puts out helpful articles about employee engagement and has excellent resources for improvement. Cons: OfficeVIbe has a feature where you can praise employees thru the site. You are given about 4 of your employees names and you pick an employee to give praise to. There is a question for you to answer and this is what I like least. The questions are the same every week. I would love to see more of a variety. Pros: It is easy for the administrator to use and very easy for the employees to use. I like being able to read the feedback as well as see the group comparison numbers. Cons: Our employees have mentioned that sometimes it seems they are answering very similar questions, so it would be nice to have more control over the survey questions. 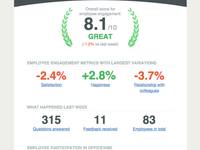 Overall: Up to the minute results of how our employees' level of engagement is. Wow. Easy. Quick. And facilitates discussions. We're getting lots of ideas and 100% participation! Pros: It is easy to use. Its new functionality allows you to add up to 5 questions and send seperate surveys which allows us to dig deeper into specific issues. Being in Quebec, its added value is also its availability in French - a must here. Its easy dashboard helps you zoom in on issues quickly. The ability to add attributes to follow engagement by attributes is also very convenient. We use it to monitor impact of transformation on employees. We get the information we need out of it. Cons: Not all the tips and tricks are translated into French yet. I know it's coming though and we can still use the English tips and tricks for most. Overall: Employees are thanking us for giving them a means to share their ideas, frustrations, good news... They appreciate the ability to tackle difficult situations anonymously but with opening from their manangent. Cons: I wish there was a way to choose/vary the questions based on what things we are hearing anecdotally are areas of concern. The surveys seem very random (maybe that's by design?) and there's really no real way to focus in on more specific areas of interest. Overall: We implemented Officevibe as our company has been struggling with employee engagement and morale issues. We have used various survey tools in the past but they always seemed to be skewed based on the day/time the person answered them, or only the disgruntled employees woudl fill them out. Officevibe takes care of that! The way the questions are worded allow for much more objective feedback and the metrics that you get out of the system are incredible. You can actually see on a day to day basis what the pulse of your organization is. We love Officevibe! Recommendations to other buyers: You should use it! 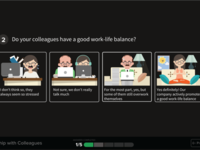 Pros: This software has a lot of great features to help improve employee engagement. I have only used the free version, but it comes with a lot of great tools and features. 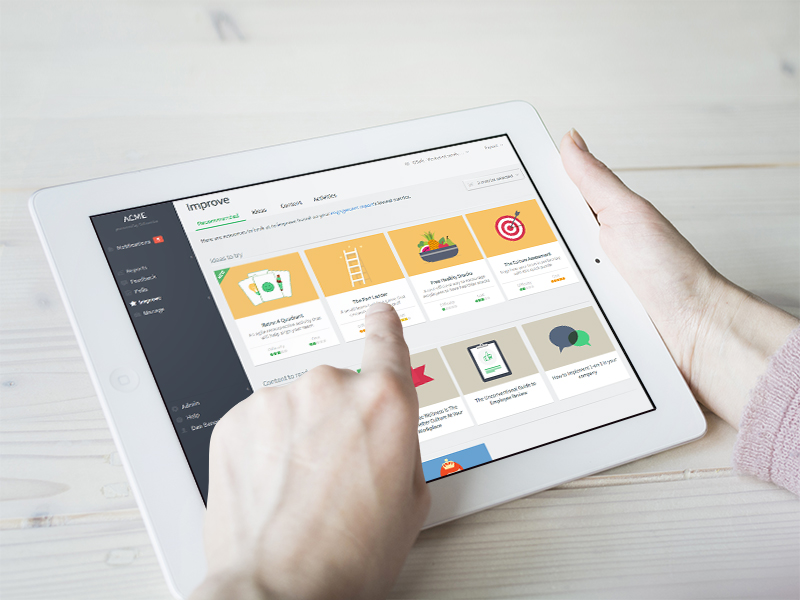 I like how it engages your employees weekly and gathers feedback from them with ease. I also like all of the educational tools that come with it. This is very informative and helpful for an HR professional like myself. Cons: The only feature that would be helpful would be to be able to create multiple groups in the free version, so we can compare. I realize this is only for the version that you will have to pay for, but it certainly would be helpful to my company. 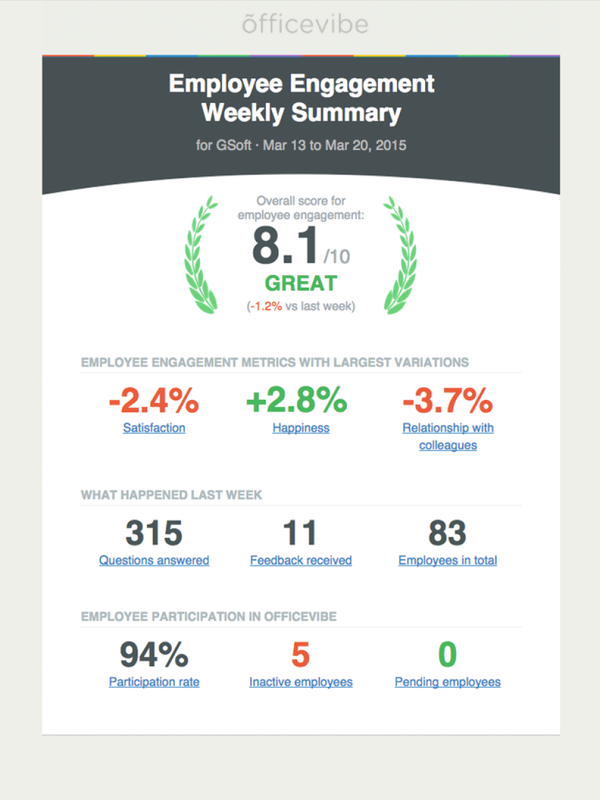 Pros: Easy, quick way to measure where you are doing well, and not so well for your staff. Since our staff are constantly on the road, it's an easy way to find out what they are thinking without having to pull staff in constantly to chat to them about the informal things in their work life. Cons: None. Not a single one. Overall: We started using Officevibe in May 2016. Easy to set up, easy to access for staff, even easier to get good anonymous feedback from staff (and respond to it). Culture surveys are quick, easy, and the results and reporting are easy to understand and due to the variety of categories reported on, easy to act on. I rate this software highly! It's awesome! You won't regret getting in on this one! Recommendations to other buyers: Buy it. You'll love it! A great tool to get feedback from your employees for how they actually feel. Pros: Very easy to use system to survey your employees to see how they actually feel about critical topics that affect your workplace culture and environment. Cons: It is hard to come up with any cons as this software works very well and doesn't really have any major flaws. I would say that it would be helpful if you had the option to type in your reasons for answering the questions if you had specific information that you wanted to expound on in each question page. Overall: Very positive, makes employees feel like they are a critical component in the team as well as allow managers to uncover any areas that need attention or changes. Pros: Leobot is a clever and unobtrusive way of getting feedback from the employees without actually requiring them to do a lot of work to get us thorough information. Cons: I don't have any cons. Overall: It gives such valuable feedback from the employees. We require a very high-caliber employee, and to give a venue for getting anonymous feedback from our employees, helps us to make sure that experiences are meeting expectations. We have made a few changes based on the input received from Leobot, our officevibe software that integrates with Slack. Recommendations to other buyers: Get it. As a manager this kind of feedback is invaluable. 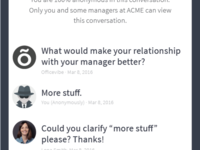 Pros: The anonymous feedback feature is a great way to get employees to open up about issues and hopefully begin conversations that can then be taken offline. Cons: Some of the measurement categories don't apply very well to all companies. For instance, the poll questions about health initiatives. Cons: The Slack integration has its bugs, and users tend to forget this integration and try to sign in with their Google account instead. Pros: I like that it can be connected to Slack so that employees get notified when it's time to reassess, respond to some questions. Anonimity is also very important and I think Officevibe handles that ok (not perfect but ok). The reports are easy to understand and the software has suggestions on how to improve some metrics. Cons: Some questions are repetitive and in some cases could be rephrased to make more sense, so in some cases user has to skip. Also if user moves the measuring bar there's no way back to skip that question anymore. But just these little things, overall it's very good. Pros: - Easy to set up groups and view trends in opinions by team/business area. - Another example of this (they may now have fixed this issue) is that you can set up custom polls and the system indicates that you can send these on a custom date, but you actually can't, they just go out with the next survey. - Questions can get repetitive and when you ask a few of them on a weekly basis, engagement can drop off. I would only recommend this product for people who already have a relatively engaged and vocal workforce. Pros: Very user friendly. The cute pictograms make it easier to understand each question at a glance. Also, it's a great tool to get a feel of everybody's opinion on all aspects of office life. Cons: I'd like to be able to see graphs and stats of what other people in my office answered. Gauge how your employees are feeling each week and boost team morale! Pros: This tool really helps to gauge team morale. We were finding our team had concerns to voice, but did not want to do it in person. 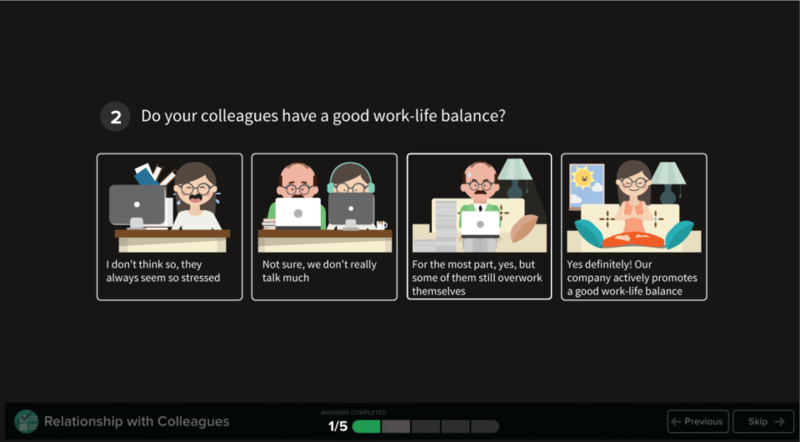 OfficeVibes lets the team's moral get measured anonymously. It is also good because it keeps measuring employee's baseline each week. We were able to implement this tool in under 30 minutes. Surveys switch up each week. Cons: It may not work as well in a smaller company, as anonymity isn't as strong. Overall: OfficeVibe has brought issues to light that management did not realize before and has helped changed the moral of the office within a short month. Cons: At times, it seems like questions can get repetitive, especially if you are using it on a weekly basis. I would add more options to counteract this. Pros: The user interface is modern, trendy and just all around nice to look at. The ability to customize questions is a nice touch and the anonymous feedback functionality inspires good confidence that employees can provide feedback without fear of reprisal. Overall: Provides keen insight on employees and the current "vibe" of the group allowing corrective action to be taken before a situation gets out of hand. Questions are short and to the point so employees actually use the tool. Pros: How easy it is to submit anonymous feedback and how quickly this feedback is shared with upper management. For our team the Slack integration seems to have increased survey responses and keeps management from forgetting to view feedback reports. Cons: The Slack integration has it's bugs, and users tend to forget this integration and try to sign in with their Google account instead. Pros: Possibility to share thoughts and give anonymous feedback with a supervisor and possibility for him to reply. Possibility to decide when we want to receive surveys. They are also really simple, easy to fill in and have nice UX. Cons: From employee perspective I don't see and drawbacks. Overall: Very useful tool especially if you want to give an anonymous feedback to your supervisor. Pros: Slack Integration - the best. It reminds you to participate in the surveys and stay engaged. Cons: I can't mention anything right now. It's good! Overall: Officevibe helps us to get frequent feedback, identify potential improvements and make sure that our employees stay happy.